Join the crowd on Cash Stampede slots for an enhanced game play! Vegas Spins gives you the chance to play a high frequency game at a low cost! 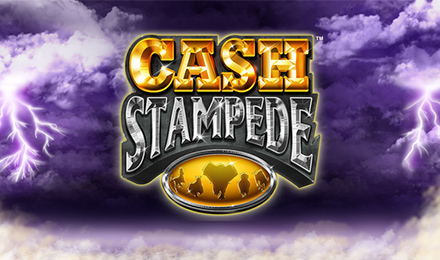 Set against a dark cloudy purple background, Cash Stampede is a 5 reel and 243 ways to win slot. The game is set with a high frequency respin feature that gives you a chance to win big in the base-game. Profit from the free games feature and receive 8 free games to spin with an enhanced chance to respin your reels. The aim of the game is to form winning combinations from right to left of the reels. Any animals with the wild substituting to form a win will start the STAMPEDE in the game. During the stampede, the more animals that join in, the bigger your wins will get!